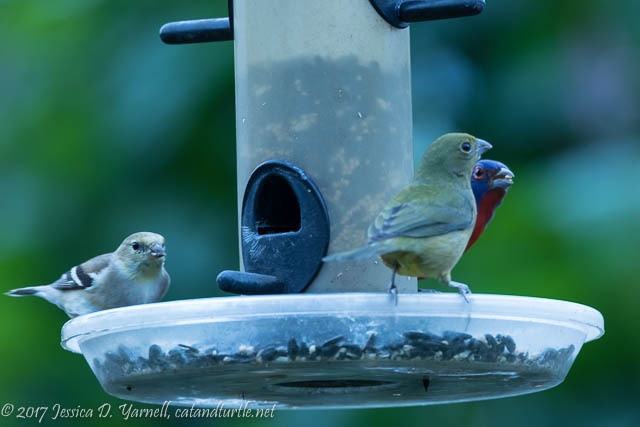 How many American Goldfinches fit on a six-port finch feeder? It was a gray, nasty day. When the weather forecast calls for 90% cloudcover, you sometimes reconsider whether it’s worth it to get up at the crack of dawn when you know the sun isn’t exactly going to “rise.” On this particular day, I enjoyed some extra sleep and wandered into my backyard around 11am. Yep, as you can see from these photos, there was no light! And yet the birds were so cheerful. 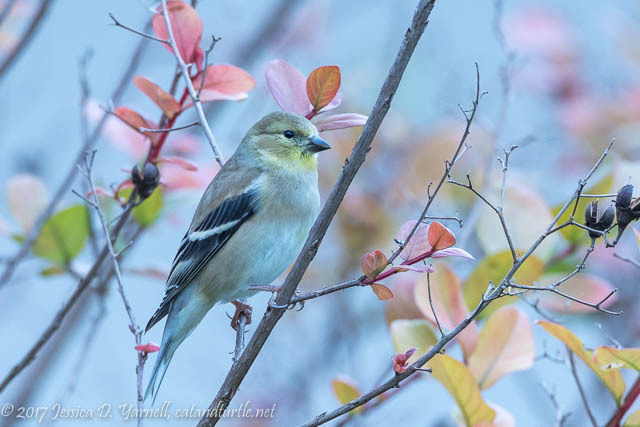 Here’s a shot of one of the goldfinches waiting his turn in the crape myrtle. This bird is starting to get some of his yellow color back. It reminded me that despite this week’s cold weather, spring is definitely on the way. 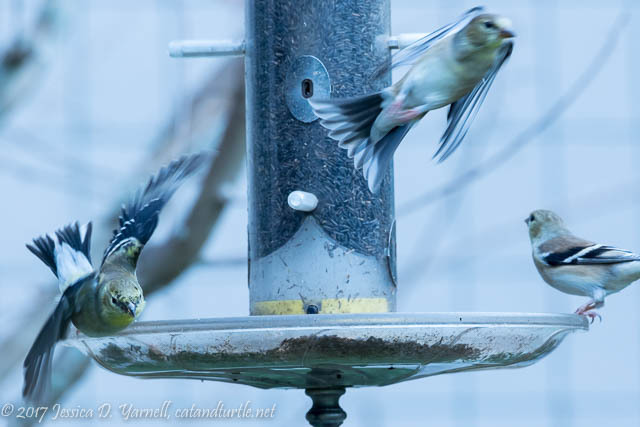 The goldfinches love the water dropper that Rich got me for Christmas. It attaches to my hose and (theoretically at least) gives the birds a steady supply of fresh water, one delightful drop at a time. In actuality it needs to be reset every day or so because it can’t keep to maintain a steady flow of drops. I loved watching the goldfinches land on the perch and bend down to sip the water as it came out. Then I had to laugh as I captured the image above. Not exactly a dignified or dainty sip! The little Palm Warblers vied for my attention as they hopped onto my American Beautyberry bush to eat bugs. They are one of our most common birds in winter, yet I never get tired of watching them. This guy admonished me for letting the mealworm cup go empty. Of course I went out and filled it for him! 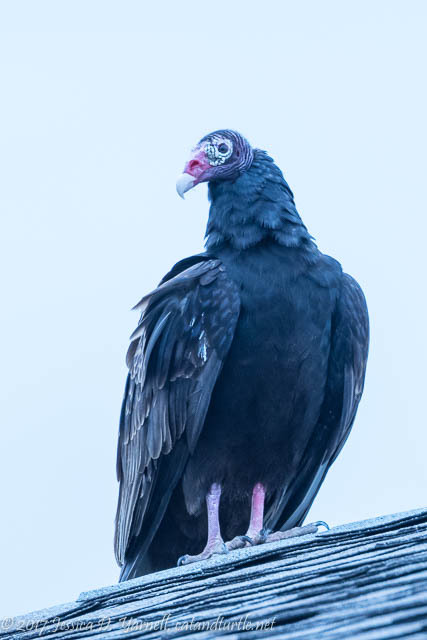 A Turkey Vulture flew low over the yard and scattered most of the little birds, who probably thought he was the resident hawk. I thought it was funny that the buntings all scattered when they sensed his flight, but the goldfinches didn’t seem to be bothered by him. He paused on my neighbor’s roof for quite some time. Vultures have such interesting, if not pretty, faces. Kinda like Wood Storks. 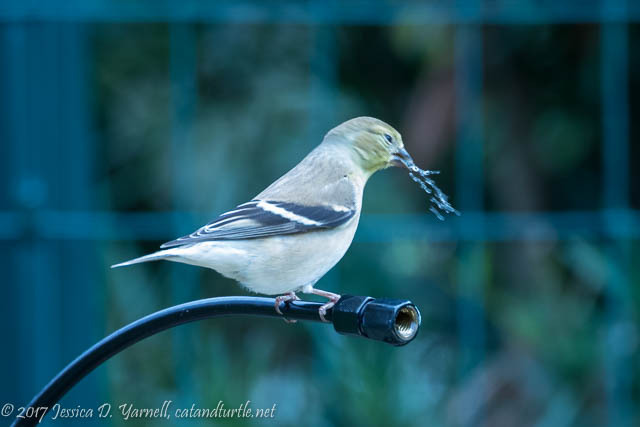 My blog started as a daily record of wildlife and plants in my backyard garden, plus snapshots of our cats and Rich's favorite turtles. 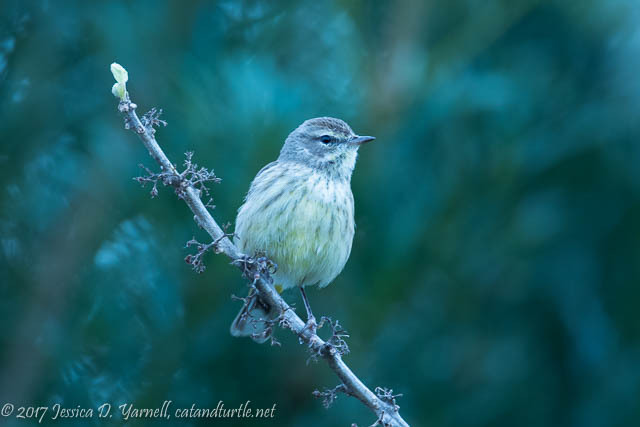 Then I discovered bird photography, and now the birds outnumber the cats and turtles! Browse the links below to see birds and other critters photographed around Central Florida. Visist my Contact Page to send me a message. Images and content © 2002-2019, Jessica D. Yarnell. All rights reserved.